Mid-Atlantic Regional Spaceport Pad 0A is seen on Oct. 28, 2014 after Orbital Sciences’ Antares rocket, with the robotic Cygnus spacecraft onboard, suffered a catastrophic anomaly moments after launch at NASA’s Wallops Flight Facility in Virginia. A series of newly released photos shows last year's explosion of a private cargo-carrying rocket in dramatic detail. You can see all of the images at NASA HQ's Flickr page. 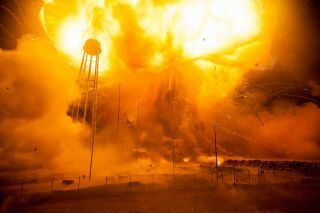 While NASA released some photos just after the Antares rocket explosion in 2014, the newly released images - which like the earlier ones were taken by NASA photographer Joel Kowsky - show dramatic views of the explosion, including the intense fireball it spawned at the Antares launchpad. Orbital Sciences' Antares rocket explodes on Oct. 28, 2014, shortly after launching the company's robotic Cygnus spacecraft on a cargo mission toward the International Space Station. Orbital ATK holds a $1.9 billion NASA contract to launch eight uncrewed cargo missions to the space station using Antares and the company's Cygnus freighter. The first two of these flights went well. The next Cygnus mission is scheduled to launch on Dec. 3 atop a United Launch Alliance Atlas V rocket, which Virginia-based Orbital will use until a retooled version of Antares that swaps out the AJ-26 engines for Russian-made RD-181s is ready to go. That should happen in spring 2016, Orbital representatives have said. Orbital Sciences' Antares rocket suffers a catastrophic failure shortly after lifting off on a robotic cargo mission to the International Space Station on Oct. 28, 2014. The AJ-26, incidentally, also has Russian heritage; it's a refurbished variant of the NK-33 engine, which the Soviet Union built for its N1 moon rocket during the space race. Orbital ATK isn't the only American spaceflight company with a NASA cargo contract. California-based SpaceX is getting $1.6 billion to fly at least 12 missions to the orbiting lab using its Falcon 9 rocket and robotic Dragon capsule. An Orbital ATK Antares rocket carrying a Cygnus spacecraft suffers explodes moments after launching from the Mid-Atlantic Regional Spaceport Pad 0A on Oct. 28, 2014 at NASA's Wallops Flight Facility on Wallops Island, Virginia. SpaceX aced the first six of these flights, but number seven ended less than three minutes after liftoff on June 28 of this year when the Falcon 9 broke apart in the skies above Florida's Cape Canaveral Air Force Station. That mishap was caused by a faulty steel strut in the Falcon 9's upper stage, SpaceX CEO Elon Musk has said. SpaceX plans to launch its next cargo mission to the International Space Station in early January.